I am still alive, honest... But baby preparations seem to have taken over my life. Over the past month or so we've decorated a room, bought carpet and loads of the 'essentials' which a newly arrived small person may need. I've done my best not to overdo it, but even on a minimal list we seem to have needed to acquire a lot of stuff (TM). In between all that, I've continued to work and so as I fast approach maternity leave I've been trying to squeeze in a little time to make something, anything. With my much diminished mojo that is easier said than done! 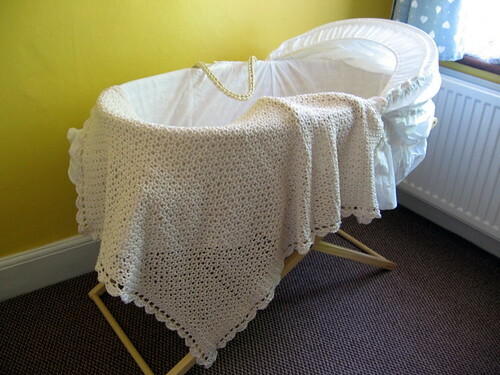 As might be expected, baby related things are very much on my mind at the moment so I thought I'd have a go at making a baby blanket suitable for a pram, moses basket or crib. I've had the Tiramisu Baby Blanket (Ravelry Link) by Alicia Paulson in my queue for a long time and so I went stash diving and had a go. This is my version of Tiramisu. 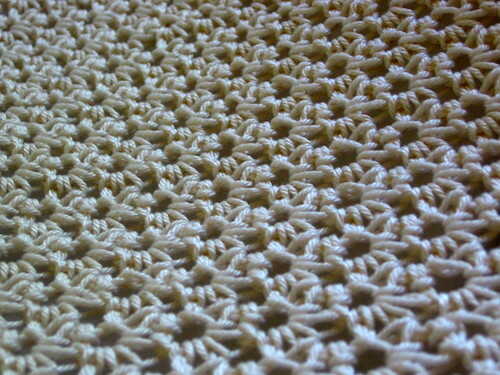 It's worked in Patons Cotton DK in a natural cotton sort of shade, so a creamy white on a 6mm hook. I didn't quite make gauge, but didn't want to go up any further in terms of hook size since I was using a thinner yarn than the pattern calls for and I wanted to keep some 'springiness' and spoing in the finished fabric. Here is a close up of the stitch pattern which is very easy to do and really didn't require much mental effort, which was a good thing. I added the border as specified by the pattern but decided against the ribbon since I'd worry about it working loose. Over all a nice little blanket, easily made up and quite quick to make. That looks lovely my dear! Look great, although I can't say the stitch pattern looks simple to do to me. I'm assuming that's the bedroom you couldn't see for books last time I visited, that looks great too. Lovely blanket :-) enjoy the nesting! Julie, This is gorgeous! I will be thinking of you in the next few days as the new little one makes its appearance and introduces him/herself to you both. Blessings to you all!! !